Yumi Katsura bridal house provides total services for every type of bridal fashion. Our seasoned professional advisors help every customer find the best dress to make her dreams come true. At any given moment Yumi Katsura has more than 400 dresses on hand. 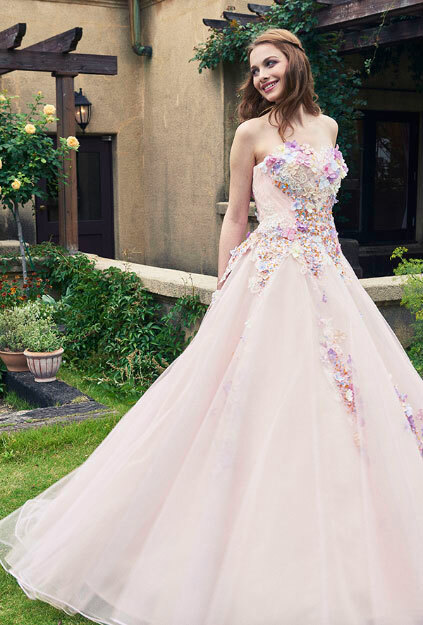 The styles range from haute couture of several genres to premier rentals that approach haute couture in quality, dresses for sale, and so much more. Yumi Katsura uses her universal knowledge of bridal fashion around the planet to create completely new signature styles for her existing collections. All of Yumi Katsura’s dresses are cut from the finest fabrics with exacting techniques and fashioned with different silhouettes. Our professional services include precise alterations to fit the dresses perfectly to our customers’ sizes. We also use a totally new fastener even for our rental dresses, as none of our rentals in stock are designed with adjustable functions. Our new fastener is essential to the back styles of our dresses, which we are determined to make supremely beautiful. We also give appropriate advice on total coordination for different types of ceremonies and reception venues to make the best of the many accessories in our salon –impressive veils to match wedding dresses, traditional and contemporary head accessories, bouquets, gloves, and jewelry of all kinds. We can also help grooms and guests select the most fitting garments for their events. By fashioning the wedding dress to the bride’s wishes, we promise that every bride who appears in a Yumi Katsura wedding dress will have a day of supreme bliss wearing a work of art. A bride in our dress presides over her ceremony in confident splendor as the world’s most beautiful woman whose every dream comes true.